Making a basic cheese plate involves four steps: buying the cheese, displaying the cheese, garnishing, and serving. This cheese plate includes three types of cheese that are sold in almost every cheese store or the cheese section of upscale grocery stores: Gruyere (cows' milk), Istara (sheep's' milk) and Humboldt Fog (goat's milk). If your cheese shop does not sell Gruyere, Istara or Humboldt Fog, ask them to suggest similar cheese. A basic cheese plate should include at least three types of cheese to represent each of the different milk types: cow, sheep, and goat. Keep flavor and texture in mind. Serving three mild, soft cheeses isn't as interesting as serving a variety of flavors and/or textures. For this cheese plate, the flavors are all mild-to-medium, but the texture of each cheese is different. First, choose your platter. Be creative! You can use a large dinner plate, a wood cutting board, a serving platter, or a cheese dome. Unwrap each cheese and evenly space them on your serving plate, leaving a space in the middle of the plate for garnish. The cheese rinds should face the center of the plate, and the part of the cheese wedge that guests will cut into should face outward. Consider cutting off any side rinds and leave only one rind on the end of the cheese. This makes it easier for guests to cut into the cheese. Cow's Milk: Gruyere has a hard texture. It is often sold in sturdy wedges that can be stood upright to add height to the plate. Sheep's Milk: Istara has a semi-soft texture. The orange rind will provide a little bit of color on the plate. If the wedge is too thin to stand up, lay it down flat on the plate. Goat's Milk: Humboldt Fog has a soft, creamy texture. Lay the wedge of cheese down flat, rather than standing it upright. This way, the beautiful line of vegetable ash down the middle of the cheese is visible. Don't cut off any of the rinds - it helps this cheese keep its shape. The easiest garnish is setting a cluster of grapes in the middle of the cheese plate or piling dried fruit or nuts in the middle of the plate. Consider using seasonal garnishes such as summer or autumn fruit. Many cheese shops also sell fruit spreads for pairing with cheese. Olives and sliced meats are also a nice accompaniment to a cheese plate. Always serve crackers and/or a sliced baguette. Other types of bread that taste great with cheese are ciabatta, french bread, and bread with dried fruit and nuts baked into it. Cheese tastes best when served at room temperature. Set knives on or near the cheese plate, ideally one for each cheese. Cheese markers are a fun way to identify the types of cheese you are serving. Provide napkins and small plates. Ideally, put out a separate serving knife for each cheese. Or, put out one knife for the Gruyere and Istara, and a separate knife for the Humboldt Fog, which is softer and messier. If you don't have a serving platter, a regular dinner plate can work just fine. 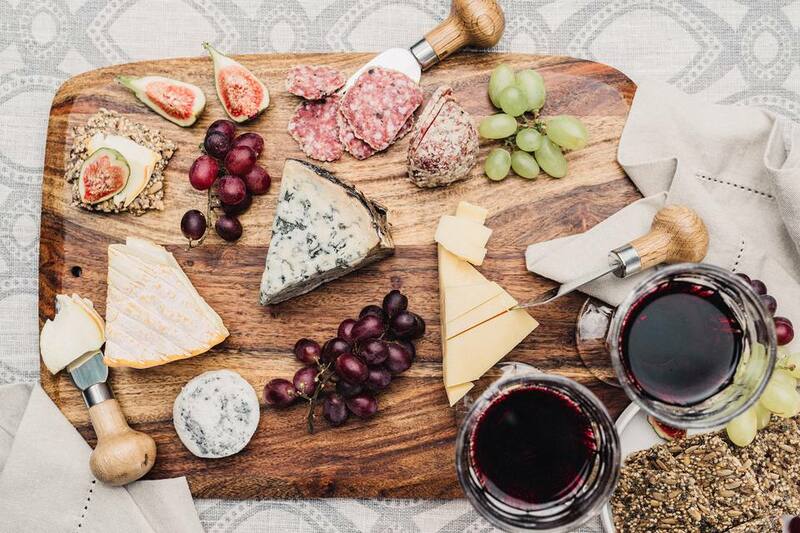 As a rule of thumb, plan for each guest to eat 1-2 ounces of each cheese you serve. If you're serving heavy garnishes (sliced meat, olives, fruit) or other food along with the cheese plate, this amount may be a bit less. A light Chardonnay will pair well with this cheese plate as will a Riesling. If you want to serve red wine, choose something light with nice fruit; perhaps a pinot noir. Always have plenty of sliced bread and/or crackers on hand. These items fill guests up, so they eat less cheese.